Relieved: we finally locate the wretched beast. I’ve always suspected that a vast quantity of suffering in the world can be put down to good intentions allied with dreadful forward planning. Yesterday was a fine illustration. 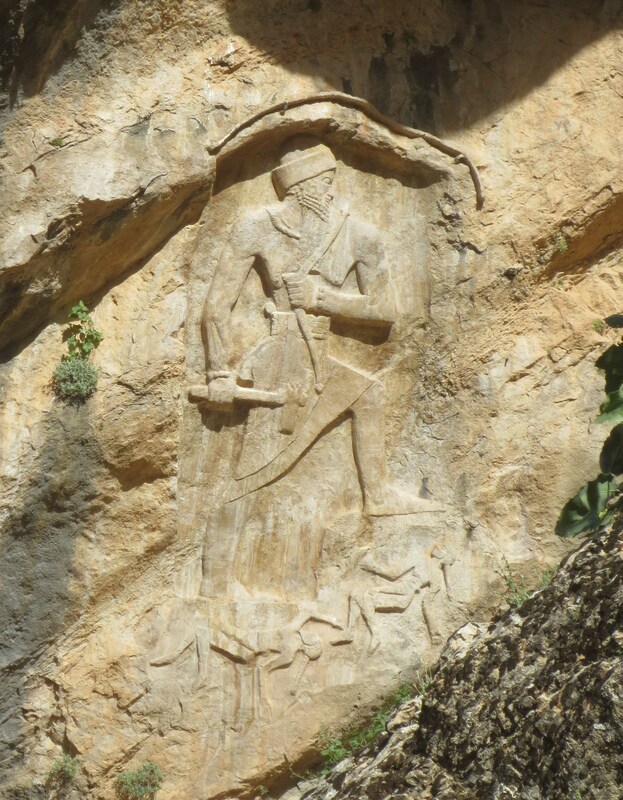 We went to stay in Suliemaniya for the weekend, partly so we could stock up on gin and kitkats, and partially because we wanted to go to see a famous ancient rock relief in the mountains. 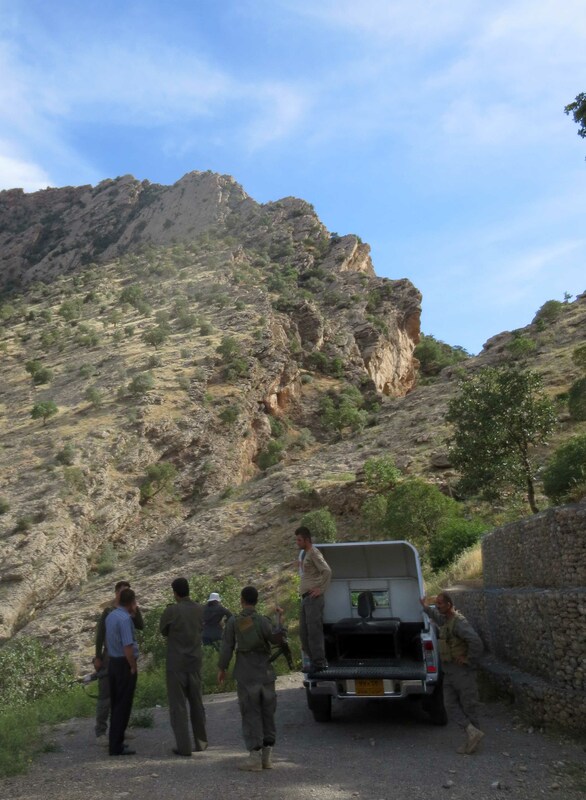 Part one went fine (except of course, that I drank too much) then we got on a bus and drove round and round in the Zagros foothills for two hours while the driver asked a series of confused strangers where this thing the foreigners want to see is. Eventually he deposited us at the end of a dirt track and set about investigating why the bus had started to produce a high pitched wailing noise when it went round corners. After ten minutes walking, it was discovered that no one in fact had the faintest idea where this thing was. We called the museum who advised us to follow the iron water pipe up the valley so this is what we did. Over an hour later I slumped to the ground in a small swamp crawling with ticks and mosquitoes and declared my ever-lasting disinterest in ancient rock reliefs. I watched the poor stragglers crawling the last few yards to the top of the mountain, drenched in sweat, weeping, scratched and bitten. As most of us thought we were getting out of the bus for ten minutes to look at a pretty picture, it hadn’t occurred to bring proper shoes, or water. As I began to drag my sleep-deprived, hung-over and desiccated remains back down the mountain, I faintly recalled saying that my main aim for the weekend was to be less tired after it than I was before. I arrived back at the bus to find that our driver had informed the Iraqi army of our failure to return and a jeep full of soldiers were waiting to see if they’d have to start a search and rescue mission. We begged half a cup of water from their officer, who looked on us with great pity for our physical exhaustion and grave mental deficiencies. The rock relief was of course just ten minutes down the track but none of us had thought to look up. Excavation is winding down now for the end of the season. I finished digging today by finding a nice goat figurine complete with a little beard. This is by far our most attractive find, the only other figurines being a remarkably ugly woman(?) and the rear end of a horse. My personal favourite find however is the set of nesting bevel-rimmed bowls I got out of Trench F. BRBs are noted for their regularity in size, about which many books and papers have been written in the past – were they for a standardised grain ration? Perhaps they were army issue bread moulds? – in the context of which I consider my collection to be the best joke I’ve heard in ages. 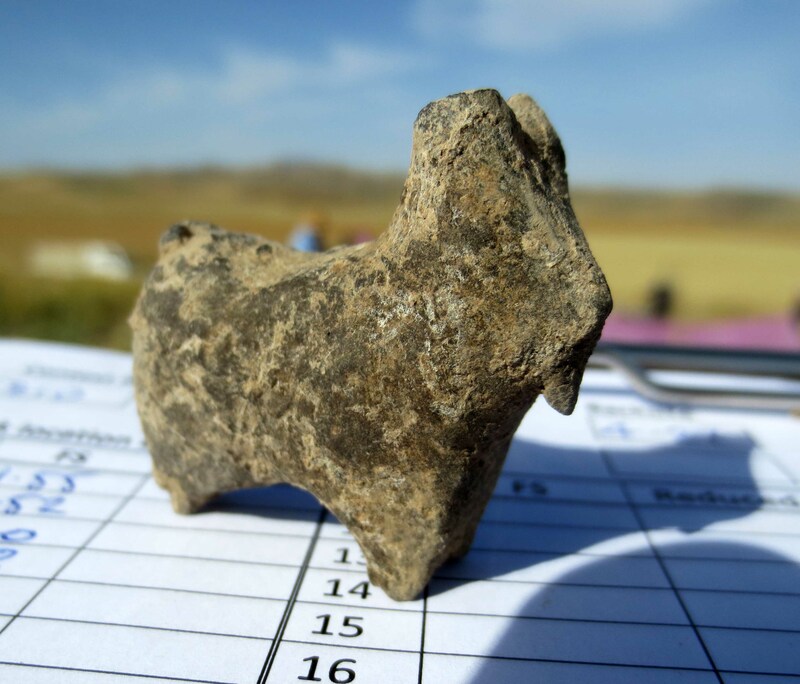 This entry was posted in Ancient Near East, archaeology, gin and tonic, goat, Iraq, Kurdistan, middle east, pottery, travel, Uncategorized and tagged archaeology, bevel-rimmed bowls, figurine, goat, Iraq, kurdistan, rescue, stupidity, uruk on May 26, 2013 by surfacefind. This weekend as I head off on a 6hr bus trip to Melbourne (Aus), to have a girls w/e away, we shall raise a toast to you and your BRB’s!!! Here’s Cheers to a job well done and a horses rear end! !